Which is why they are a special treat for me on Christmas Eve, giving me all the energy I need for the long night ahead! Now that spring is on the way, the ice is melting in Lapland and it is the season for fresh fish! One of my favourite recipes for a cold spring day is salmon soup. Not only is it a bit healthy (as we all know, the missus has me on a diet these days), but it is warming, quick and easy to make. 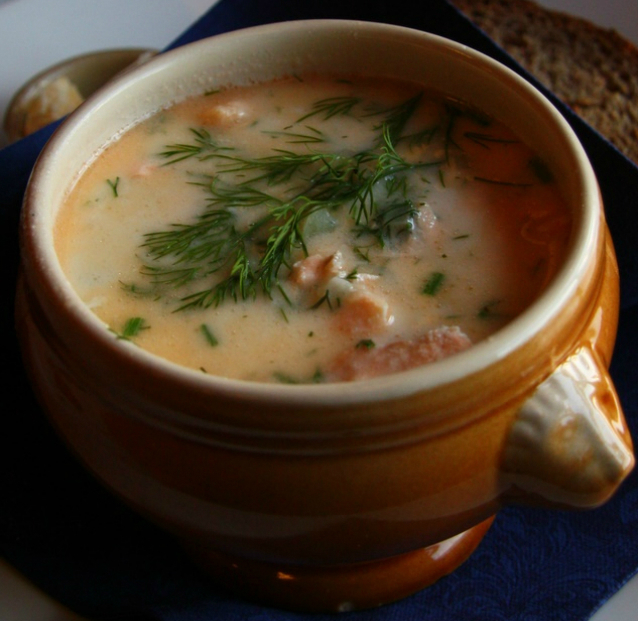 The Helsinki Times has an excellent recipe for salmon soup that I’d love to share with you. 1. Melt the butter in a large stock pot over medium heat. 2. Add flour and stir. Once combined, add the prepared fish stock and stir. Simmer over low to medium heat for 10 minutes. 3. While the soup base simmers, prepare the salmon: remove skin and cut into 2cm cubes. 4. Add to soup and stir gently, so the salmon pieces do not flake. Cook for five minutes. 5. Add milk and cream and turn down the heat. Allow the soup to warm through, stirring, and remove from heat. 6. Season with dill, salt and black pepper and garnish with chopped chives. I love this soup with a piece of tasty flatbread, warm from the oven. It is also a great recipe for feeding a crowd – it is always popular in my workshop after a long day’s work.